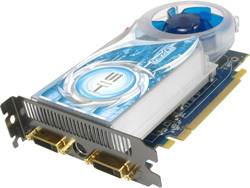 Connection to 400 Watt (550 for CrossFire™) or greater power supply with two 2x3-pin PCIe® power connectors is required. 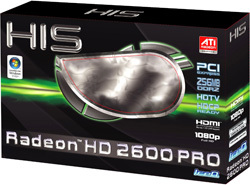 Starting from the new Radeon™ HD 2600 Series, HIS has applied the “HD” concept design on its new models. Features include: high-quality gold-plated ports, black panel plate which sync. with the “High-definition” concept of the new Radeon™ HD Series. HIS IceQ is endorsed as the most efficient cooling technology among the current mainstream graphic cards' series. HIS IceQ can actively draw the air inside your PC case to cool down the card, and blows amounts of hot air out of your case, dramatically decreasing the GPU temperature together with your PC components. Ultra quiet HIS IceQ fan keeps the noise level below 30dB. HIS IceQ is also UV sensitive, enhancing the gamers’ UV light case. This card can play all of new games even it just have DDR2 memory. The temperature never reach 60C, often at 55C at full load. Just has a little different with other card with same chipset that use GDDR3 memory.
" First Place in Best Buy Award "
"Best Buy - Mainstream Category for HD 2600Pro IceQ 256MB"
"First place in Mainstream Best Buy"